The former roofless outdoor ice rink, which was part of an existing landscaped recreational swimming complex, needed to be replaced due to old technology and a chilling unit that did not comply to current regulations. Due to a tight budget, the city of Niesky was interested in a new ice rink with a roof, but without a facade, leaving the ice-rink exposed to outdoor conditions (humidity, temperature, etc). This solution is low in investment and operational costs because the facility can operate without energy consuming air-conditioning technology. However, the main issue of covered ice rinks without a facade is fog and condensation due to moist air entering the ice rink that condenses over the ice. The condensation issue mentioned above, the goal to minimize the use of material, as well as the wish for natural lighting led to our design proposal: an cathedral-like roof using arched beams with a maximum height of 15 m in the center and 6 m around the perimeter. The dome geometry maximizes the volume of air in the arena, hence reducing condensation in the arena to a minimum. The approx. 3600 m² roof appears to be floating freely while spanning 41 m, covering the ice rink and the adjacent stands, and giving protection from precipitation, winds and stormy weather. The structural system consists of filigree three-hinged arches in combination with thin tension cables eliminating thrust at the supports. The roof is stiffened by corrugated metal decking and by a horizontal ring beam around the perimeter. Two rows of operable large skylights provide natural light and additional natural ventilation. 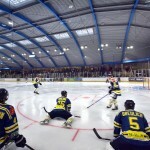 Not only the local ice hockey club ELV Tornados Niesky has a new home ground in this modern, spacious ice stadium with its dome-like roof. The ice rink offers great opportunities for the public – including schools – to ice skate. The city of Niesky is proud that the venue was greatly accepted by the public: In the first year of operation, the stadium was used by over 44.000 visitors (see attached documents). Due to the proximity to the adjacent swimming pool, the complex is also utilized in the summer, including changing rooms, kiosk and restrooms. The ice rink area offers for possibilities for inline-skating, beach volleyball, etc. 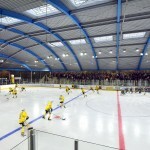 The attractive new venue creates a prestigious feature for the city of Niesky, continuing its long ice rink tradition.